News Release from the Church of Belgium: Cardinal Godfried Danneels, Archbishop Emeritus of Mechelen-Brussels, died this morning, March 14, 2019, in his hometown in Mechelen. Cardinal Jozef De Kesel, archbishop of Mechelen-Brussels and chairman of the Belgian bishops' conference, has the sad duty to inform you that Cardinal Godfried Danneels, emeritus archbishop of Mechelen-Brussels, this morning, Thursday March 14, 2019, in his hometown in Mechelen is deceased. His funeral will take place in the metropolitan St. Rombouts Cathedral in Mechelen next Friday, March 22, 2019. Godfried Danneels was born on 4 June 1933 in Kanegem as the eldest of six in an educational family. From 1945 to 1951 he went to school at the Sint-Jozefscollege in Tielt. Subsequently, he started the priesthood training at the seminary of the diocese of Bruges. That immediately sent him to the Catholic University of Leuven to study Philosophy. After obtaining his degree in law, he subsequently studied Theology at the Gregorian University in Rome (1954-1959). In 1957 he was ordained a priest in the parish church of Kanegem. From 1959 he was spiritual director and lecturer in liturgy and sacrament at the Great Seminary of Bruges. In 1961 he was promoted to Doctor of Theology at the Gregorian University in Rome. From 1969 he combined his assignments at the Bruges Major Seminary with a teaching position at the Faculty of Theology at KU Leuven. He then also became editorial secretary of Collationes, the Flemish magazine for theology and pastoral. On November 16, 1977, he was appointed bishop of Antwerp by Pope Paul VI. On December 18 of that year, he was ordained a bishop by Cardinal Leo Suenens, with bishop Emiel-Jozef De Smedt, Jules Victor Daem, Jean Huard and Guillaume Marie van Zuylen. He chose Apparuit humanitas Dei nostri as the bishop's slogan (Appeared is the humanity of our God) according to the apostle Paul's letter to Titus (3, 4). On December 21, 1979, Pope Joannes Paul II appointed Godfried Danneels Archbishop of Mechelen-Brussels. On January 4, 1980 he took possession of the seat. On 2 February 1983, he was created as a cardinal priest. He was assigned the title church of St Anastasia Basilica in Rome. 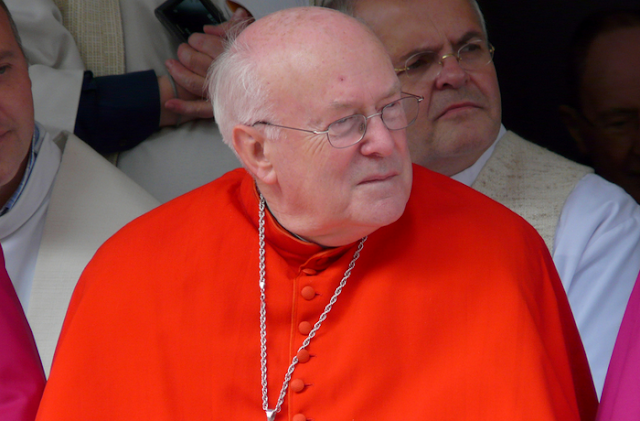 On 4 June 2008, the day on which he turned 75, Cardinal Danneels, as prescribed by ecclesiastical law, submitted his resignation to Pope Benedict XVI as the resigning archbishop of Mechelen-Brussels. It was accepted on February 27, 2010. With his retirement Godfried Danneels withdrew from public life. He could now give full attention to what was dear to him: prayer, literature and other forms of art and time for friends and acquaintances. At the express request of Pope Francis, he still participated in family synods in 2014 and 2015. His physical health gradually deteriorated. Today, March 14, 2019, he died at the age of 85. The funeral of Cardinal Godfried Danneels takes place in the metropolitan St. Rombouts Cathedral in Mechelen. The service will be led by Cardinal Joseph De Kesel, in concelebration with, among others, the Papal Nunciï, the Belgian Bishops and the priests and deacons of the Archdiocese. Cardinal Jozef De Kesel offers his Christian participation to the family, friends and many former colleagues and employees of Cardinal Danneels on behalf of the entire Belgian Catholic Church. Cardinal Jozef De Kesel: “We are very grateful to Cardinal Danneels. For many years he has exercised shepherding in the Church in a period of fundamental changes in Church and society. Gradually his appearance has grown, both in our country and in the world church. Through his word, spoken and written with so much passion, he has always led us to the source. Always with a soft hand. He has also experienced trials, and in the end he was greatly weakened and exhausted. We continue to thank him gratefully. May he rest in God's peace. "